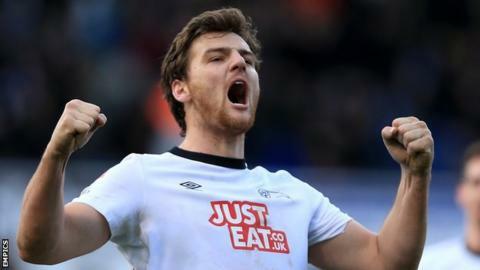 Striker Chris Martin scored his eighth goal in the Championship this season to help Derby County seal all three points against Huddersfield Town. Derby took the lead when Martin pounced on Johnny Russell's scuffed volley to tap the ball past Jed Steer. The hosts equalised as Mustapha Carayol crossed to Ishmael Miller, who hit the crossbar before Harry Bunn fired home. But George Thorne struck from 30 yards to restore the visitors' advantage after the restart to seal victory. The result means Derby extend their unbeaten run in the Championship to eight games and move up to fifth in the table, while Huddersfield slip to 15th. The visitors broke the deadlock after 15 minutes when Martin latched onto Russell's shot to score his third goal in three games. Both teams suffered early injuries, with Huddersfield losing Sean Scannell to a hamstring problem and Derby forced to bring off Tom Ince midway through the first half. The Terriers restored parity after Carayol's cross found Miller, who tapped a shot from close range against the bar and Bunn was on hand to fire home. Derby enjoyed the perfect start to the second half as Thorne unleashed a powerful shot from long range, which had Steer well beaten. Steer kept Derby from adding to their tally, providing a fine save to deny Martin a second goal, after the Rams striker linked up well with Andreas Weimann. "We have played one of the best teams in the league and it was a tough ask for us. "They scored an outstanding goal, one of the best you will see this season. We tested Scott Carson but not as much as they tested Jed Steer. He made three fantastic saves. "I felt we had a good shout for a penalty but there's no disgrace losing to Derby. The gulf between the squads is obvious but we are in this league on merit. Taking points off the likes of Brighton and Derby are bonus points." "We didn't capitalise in the first half and I challenged the players at half-time to go and win the gam. "It's been a really tough week with back-to-back away games but the players responded. There's a great spirit in the squad. "It's a good run of results but I always want more and always want better. We are only going to improve." Match ends, Huddersfield Town 1, Derby County 2. Second Half ends, Huddersfield Town 1, Derby County 2. Attempt missed. Jason Davidson (Huddersfield Town) left footed shot from the left side of the box is too high. Assisted by Jamie Paterson. Attempt missed. Andreas Weimann (Derby County) right footed shot from more than 40 yards on the right wing misses to the left. Assisted by Darren Bent with a headed pass following a fast break. Attempt missed. Jed Steer (Huddersfield Town) header from the centre of the box misses to the right. Assisted by Jamie Paterson with a cross following a corner. Martin Cranie (Huddersfield Town) wins a free kick in the defensive half. Delay in match George Thorne (Derby County) because of an injury. Substitution, Huddersfield Town. Florent Bojaj replaces Ishmael Miller. Attempt missed. Jamie Paterson (Huddersfield Town) right footed shot from the right side of the box is close, but misses to the right. Assisted by Mustapha Carayol. Mark Hudson (Huddersfield Town) wins a free kick in the attacking half. Attempt blocked. Jamie Paterson (Huddersfield Town) right footed shot from outside the box is blocked. Assisted by Jason Davidson. Attempt saved. Chris Martin (Derby County) left footed shot from the left side of the box is saved in the centre of the goal. Assisted by Andreas Weimann. Attempt blocked. Emyr Huws (Huddersfield Town) left footed shot from outside the box is blocked. Attempt blocked. Martin Cranie (Huddersfield Town) header from the centre of the box is blocked. Assisted by Mustapha Carayol with a cross. Corner, Huddersfield Town. Conceded by Craig Forsyth. Substitution, Derby County. Jamie Hanson replaces Johnny Russell. Attempt saved. Chris Martin (Derby County) header from the right side of the six yard box is saved in the top centre of the goal. Assisted by Johnny Russell with a cross. Corner, Derby County. Conceded by Jed Steer. Attempt saved. Cyrus Christie (Derby County) right footed shot from the centre of the box is saved in the centre of the goal. Attempt missed. Nahki Wells (Huddersfield Town) right footed shot from outside the box misses to the left. Assisted by Harry Bunn. Attempt saved. Johnny Russell (Derby County) left footed shot from the right side of the box is saved in the centre of the goal. Assisted by Jacob Butterfield. Attempt blocked. Bradley Johnson (Derby County) left footed shot from outside the box is blocked. Assisted by Jacob Butterfield. Attempt blocked. Chris Martin (Derby County) left footed shot from the centre of the box is blocked. Assisted by Craig Forsyth with a cross.